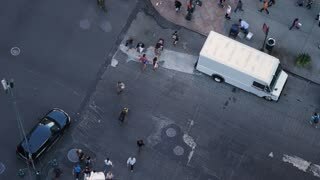 A high angle view of pedestrians and traffic on 5th Avenue in midtown Manhattan. NEW YORK CITY - Circa October, 2017 - A high angle view of pedestrians and traffic on 5th Avenue in midtown Manhattan. 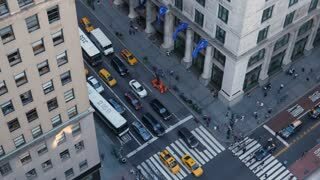 A high angle, slow motion view of pedestrians and traffic on 5th Avenue in midtown Manhattan. 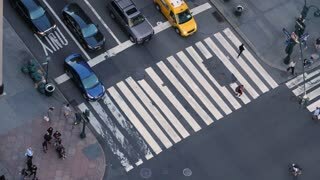 NEW YORK CITY - Circa October, 2017 - A high angle view of traffic and pedestrians on 5th Avenue in midtown Manhattan. 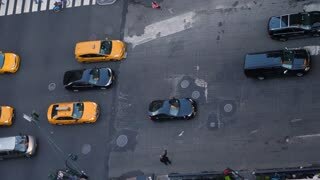 NEW YORK CITY - Circa October, 2017 - A high angle aerial view of traffic on 5th Avenue in midtown Manhattan. A daytime high angle establishing shot view of traffic along 10th Avenue in midtown Manhattan. A daytime high angle establishing shot view of traffic along 10th Avenue and West 23rd Street in midtown Manhattan. A daytime high angle establishing shot view of traffic along 10th Avenue and West 26th Street in midtown Manhattan.